Research states that children love to play outdoors and they should play outdoors as well when they can, and preferably, in natural surroundings. Children also show a marked fondness for natural creations like flowers, plants, animals, or insects when selecting play mates! Thus, natural spaces like back yards have tremendous potential for offering a suitable playground for children. Researchers White and Stoeklin believe that given an opportunity, children would design play grounds in open, outdoor spaces—richly decorated with plants, flowers, a small pond, fish, turtles, birds, or whatever else their wild imagination would include. So, now you may explore how you can free up some space in your crowded backyard to provide a play area for your children. This article will not only provide you tips on freeing up space in your back yard, but also some marvelous design ideas for building an attractive play area for your children. If your back yard has too many trees or bushes, this is definitely the time to clear them out. An open, green lawn with a shed on one portion of the yard may be more amenable to designing a play area. You can redesign your yard by cutting off long trees or bushes, planting multi-colored, flowering plants, and trimming your grass. This will not only free up space, but also create a clean, clutter-free look for children to enjoy. As you review the ground in your back yard, you have to ensure that all the rotting plants or are cleaned out to recoup space to build the play area. Unless your ground is maintained well, you cannot design a flower garden or a pond. Research states that children are easily attracted to bright, open, colorful spaces—so ideas of a flower garden, a fountain, or a sand box may be right on. In most families—odds and ends such as toys, broken bicycles, lawn mower, gardening tools—fill up much of the space in the back yard. You may have to identify all such odds and ends, and remove them to an attic, to a basement, or to a closet to make space in your back yard. You could also take items that do not work and that could be a hazard to the dump or to a recycling operation. After removing all the unnecessary items, you will regain some free space in your back yard. This is another poignant idea for freeing up outdoor space. Although wood is the popular choice of furniture in back yards, you may want to replace them with foldable, plastic furniture. This way, whenever the furniture is lying unused, they can be folded and tucked away in the covered plastic shed for storage. If you manage to discover foldable, outdoor furniture in another material, you are free to choose that rather than plastic outdoor furniture. The idea is to create free space. Now that you have created space for the children’s play area in your back yard, involve the children in your household to complete the next few steps. Your children, with their natural creativity, are ideally suited to provide you with some awesome design ideas or tips for building a functional and attractive play area. If you are planning to go ahead with the next designing steps, encourage the children to voice their ideas at this stage. The best ideas, as you know, are always born out of collaboration. 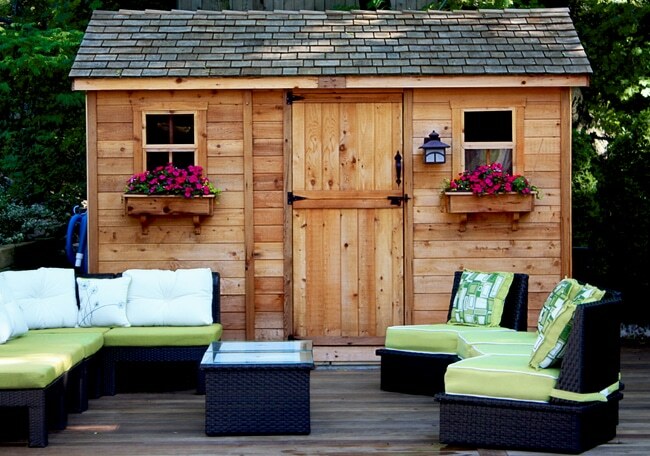 Once you have the necessary amount of space for a play area in your back yard, the next step may be to build a shed. A plastic shed is practical and suitable, but you may select another material such as western red cedar to build the shed out of. A shed comes in handy for storing stuff. At other times, children can even use the furniture in the shed to relax or play board games as the long as the furniture includes a table. One unique design philosophy that rules outdoor play areas for children is “multi-level platform.” These ideas can take the shape of multi-level flower beds, multi-level sitting areas, or simple steps to enchant small children. So depending on your available back yard design and available budget, you may think of creating some steps around a small pond or a two-level concrete platform for sitting and playing with nature’s creations. Once you have all those ready, now you can carefully select a special area, and install some hardware items to add to the functionality of the play area. Most surveys on children prove that children have a fascination for water and sand; so you can certainly add a pond, or a fountain, or even a sandbox. You can add animals, birds, insects, or whatever else you think your children would love to play with. If your ground is ready for hardware installation, you can think of installing a swing, or a seesaw. Children should have more alternatives than just video games to play with.